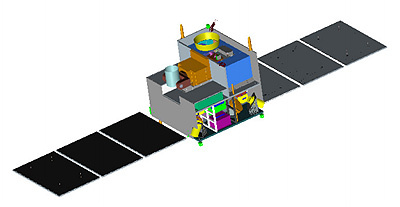 QSS (Quantum Science Satellite) or Mozi, also known as QUESS (Quantum Experiments at Space Scale), is a Chinese minisatellite to establish a space platform with long-distance satellite and ground quantum channel, and to carry out a series of tests about fundamental quantum principles and protocols in space-based large scale. To set up an ultra-long-range quantum channel between ground and satellite with the assistance of high-precision acquisition, tracking and pointing system, implement a quantum key distribution between the satellite and the ground stations, and carry out unconditional secure quantum communication experiments. To set up a real wide-area network for quantum communication using the satellite repeater and two arbitrary quantum ground stations and their auxiliary local-area fiber quantum networks. Distribution of quantum entangled photons from the satellite to two distant ground stations whose distance is larger than one thousand kilometers; test of the entanglement properties at a large scale and nonlocality of quantum mechanics. as a totally new way of communication, quantum teleportation is the fundamental process of quantum networks and quantum computing. A high quality quantum entanglement source on the ground will be built to achieve ground-to-satellite teleportation experiments based on photon entanglement. QSS was launched in Augus 2016 on a CZ-2D (2) rocket.